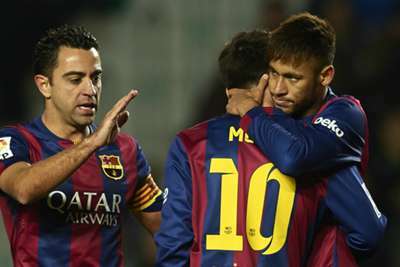 Xavi believes Neymar "has to mature" if he is to reach the same level as Lionel Messi. The former Barcelona midfielder was asked to assess the merits of his two ex-team-mates and, although he remains a fan of Neymar, thinks Messi is a step ahead at the current time. Neymar left Camp Nou for Paris Saint-Germain for a world record €222 million in August 2017 but reports in Spain suggest the Brazil star is eager to return and re-form a previously prolific triumvirate with Messi and Luis Suarez. Speaking to Super Deportivo de Villa Trinidad, Xavi said of Messi and Neymar: "They are different. I see Leo with great footballing maturity. He does everything well. Neymar is a person who has to mature, but he seems like a player with enormous capacity to make a difference. "Although he could improve, he is among the top players in the world." Xavi also backed Messi in the face of blistering criticism from Diego Maradona, who said the five-time Ballon d'Or winner did not possess the leadership skills required to captain Argentina. "I disagree with Maradona," he added. "Messi is an incredible leader, he is maybe quiet in the dressing toom but he's an absolute leader. He always wants the ball, he always offers himself, he has personality. He has never hidden. "I don't like it when former footballers are too critical with former team-mates. I'm not just talking about Maradona, but in general. "These footballers who are very critical with their professional team-mates...they have been there and they know the difficulty. I don't understand the strong criticism against players when you have been there too." Argentina's underwhelming World Cup campaign in Russia has led to speculation Messi will step away from international football but Xavi believes the 31-year-old will continue to play for his country. "I think he'll return. He needs time to reflect and to rest but I think he'll go back," he said. "He is a competitive beast and he will want to try and win with Argentina."